Cincinnati Bengals fans with long memories will recognize the above photo. It's from a Monday Night Football game against the Steelers in 1983 in which Pittsburgh's Keith Gary tried to remove quarterback Ken Anderson's head. I was at the game, which the Bengals lost. I remember the outrage among Cincinnati fans and coach Forrest Gregg that Gary was not penalized despite the fact that Anderson was knocked from the game. 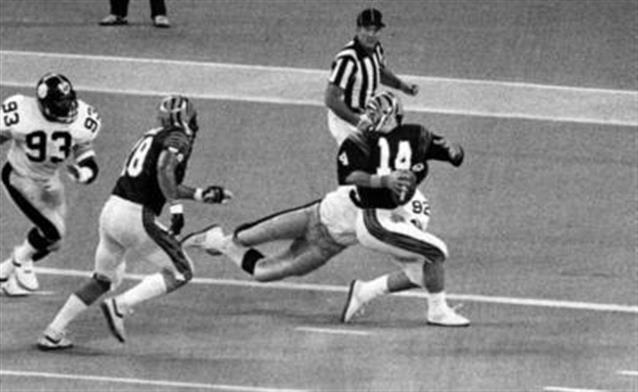 Gary later was penalized for a cheap shot on Bengals backup QB Turk Schoenert. Steelers coach Chuck Noll defended Gary. There has been a lot of Bengals-Steeler craziness since 1983, but in my almost 40 years as a Bengals fan and NFL fan, I think the second half of the Bengals-Steelers wildcard game was perhaps the craziest and ugliest that I have ever seen. The Bengals absolutely deserved to lose, if for no other reason than with less than two minutes left, they gave the ball back to a team with a good QB, who only needed a field goal to win -- and had three timeouts in his pocket. In the pass happy NFL, that’s a recipe for disaster. And it was. The loss was bad enough. But the sour taste of defeat is compounded by this: the game was about as poorly officiated as can be and the Bengals were the ones that got completely screwed. Basically, it was the NFL taking the NHL approach to things: let the players kill each other and then pretend to sort it out later after the injuries have occurred and the players' brains scrambled. Everything wrong with the NFL's approach to player safety was visible on one play: the blatant hit to the head on Bengals running back Giovanni Bernard. Officials did not throw the flag but then -- unbelievably -- reviewed the play at the request of Steelers coach Mike Tomlin to determine if Bernard fumbled after being knocked out. Stay classy, Pittsburgh! Be classy, Coach Mike! The message this sends the rest of the league: head shots are fine (and may not even be flagged) as long as they cause a turnover. Aggravating things further: Shawn Williams was flagged earlier for a hit to the head. But when it was a Bengals player put in danger....no flag. Of course, none of this excuses the Burfict hit on Antonio Brown in the game's final seconds. Both teams were desperate and it was the type of hit that happened so quickly it wasn't obvious what happened at first. But NFL defenders should by now know to do anything possible to avoid head contact -- or the appearance of head contact -- on a stretched-out receiver. So, yes, Burfict should be fined and possibly suspended -- and should have been ejected from last night's game. Hopefully the Steelers are fined, too, for allowing assistant coaches to mix it up with players. But the other 15-yard unsportsmanlike penalty on Adam Jones? A ridiculous call given that it was well after the whistle and was not involving behavior that put anyone's safety at risk. It was really a reflection of how ludicrous officiating is in the NFL -- some head shots are called, others are not. I think the media is piling on to the Bengals to an extent that’s ridiculous. Bill Cowher led his team through a “who dey” chant after they broke Carson Palmer’s knee in a playoff game on a questionable hit. That showed little class and Cowher has no right to second-guess any coach. And former Bengals QB Boomer Esiason? I don’t recall him standing up to or getting some of his thug teammates under control in the late 1980s. Instead he acted as if he was blind to it. To demand that Marvin Lewis get control of his players exposes Esiason for the liar, hypocrite and fan boy that he is. Nor did Jim Nantz or Phil Simms show themselves to be that knowledgeable about the Bengals-Steelers rivalry -- nor did they show much outrage over the dirty shot on Bernard. They sounded like a couple of idiots sitting in the stands. As supposed journalists, Nantz and Simms failed to acknowledge some of the long history between these two teams and the very real fact that the Steelers have shown plenty of thug tendencies -- Hines Ward breaking Keith Rivers' jaw or the 2013 cheap shot by the Steelers' Terence Garvin that broke Bengals' punter Kevin Huber's jaw. And thus my frustration: a lot of media elites and others expressing disgust with the Bengals last night because of the actions of a few fans and one player. Where has been that disgust with the Steelers, who have been thugging it up for years and largely getting away with it? I suspect they get away with it because they've found a way to win. And winning means everything in the brand-conscious NFL. Sigh. Triple sigh. I do hope that Antonio Brown is okay and that he can play against Denver next week. As frustrated as I am with Pittsburgh, I would hate to see him miss that game as he's an exciting player and his injury was preventable. If Brown can't go and the Steelers lose, perhaps the NFL will decide that the NHL way of doing things isn't what most of its fans and customers really want. As a Bengals fan, some other things must be said. If there is a criticism of Marvin Lewis to be made, it's this: he doesn't manage the clock or game situations well, especially in the second half of games -- when teams often out-adjust the Bengals. Last night's game might not have been played if the Bengals had not tried to throw deep to A.J. Green on third down for the go-ahead touchdown against the Cardinals. Instead, the Bengals tied the game on a field goal and then gave the ball back to Carson Palmer and the Cardinals with way too much time on the clock. Result: Cardinals win, Bengals go 12-4 and end up the No. 3 seed. Much the same can be said about the Bengals' loss at Denver -- the Broncos out-adjusted them and won both the second half and OT. Gregg Easterbrook, in his Tuesday Morning Quarterback column, also makes an excellent point: facing 4-and-3 deep in Steelers territory and trailing 15-7 late in the fourth quarter, Lewis decided to kick a field goal. It probably would have been wiser to go for it. Just as it would have been wise for Hue Jackson -- the Bengals offensive coordinator -- to have called a two-point conversion play involving A.J. Green when the Bengals were up 16-15. All that said, both Pittsburgh and Cincinnati showed considerable heart and skill last night, including Big Ben, A.J. McCarron, Green and a host of others on both teams. Roethlisberger, in particular, is one of those veteran guys who knows how to win in the league and knows how to take what teams give him. Here’s the thing: the Broncos are the worst No. 1 seed in recent memory. Peyton Manning's arm strength is terrible and the Steelers should be able to force turnovers against him. Denver should go with their backup. As a fan, I really hope that Antonio Brown is okay to play — he’s an exciting player. And if the Steelers lose at Denver? Oh, I'll sleep fine after that.